Police are to send a report to the Football Association after the Boston manager Steve Evans was thrown out of Grimsby Town's ground at the weekend. Evans protested against referee Paul Armstrong's decision not to send off Grimsby keeper Steve Mildenhall for seemingly handling outside his area. Boston chairman Jon Sotnick is to launch his own investigation. "There seems to be a conspiracy at work," said Sotnick, who is to discuss the matter with Lincolnshire Police. "At every game Steve seems to be singled out for extra attention from the police - and I'm determined to get the bottom of this. "This was a disgrace and I've launched my own investigation to find out why the police ejected an employee of mine from his place of work. "It's one thing being sent to the stands but this went way beyond that and I want answers. "Steve is no angel, and his language can be rather colourful at times, but that in no way excuses how he was treated." Sotnick added that the decision to eject Evans from the ground was dangerous. "Steve was thrown out of the ground with no money, no mobile phone and was left to fend for himself," added the chairman. 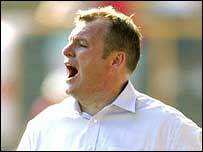 Evans released a statement after being escorted from a dugout saying he was "disappointed" by the action taken. He added: "After talking to John Barnwell (League Managers Association chief executive) I will make no further comment." Evans was forced to watch the rest of the game from the team coach.